A few weeks ago, I made a thick, rich soup featuring sweet potatoes, peanut butter, green chiles, onions, and tomato juice. Sound weird? Actually, the recipe was inspired by groundnut soup, a classic West African dish — and the results were deliciously sweet and savory. I was trying to branch out and learn about unfamiliar food traditions. But perhaps the best part was the fact that I made an entire meal — pun intended — for just peanuts. Like many if not most Americans, my husband and I have become more conservative with our grocery shopping during the recession of the past few years. If things were up to him, we’d happily eat spaghetti every night. But I prefer a little more variety. So, here are eight ways I’ve learned to dine well while still saving money. #(clear n1). Explore your family’s culinary history. Over the last year, my grandmother and great-aunt have been teaching me to make traditional Polish food. They have their mother’s recipes — some on paper, some in their heads — to work with. My favorite meal so far is pierogi made with a simple dough of potatoes, flour, eggs, and salt, then stuffed with sauerkraut or farmer's cheese, a mild cheese with a texture like feta. This is good, hearty food made with inexpensive ingredients. Don’t have elders around to cook with? Research your ethnic background (or ethnic-food interests) via cookbooks and blogs. #(clear n2). Participate in Meatless Monday. Eating more vegetarian meals is one of the most effective ways to combat climate change, according to a 2010 United Nations report. Vegetarian meals are good for your health, too; vegetarians have a lower risk of developing coronary heart disease and some forms of cancer. Meatless Mondays, a campaign encouraging people to give up meat one day a week, is one way to jump on board. Meals made with vegetables are less expensive than meaty feasts, and can be just as delicious. Try red lentil and winter squash dal, an Indian dish, or borscht, an Eastern European beet soup. #(clear n3). 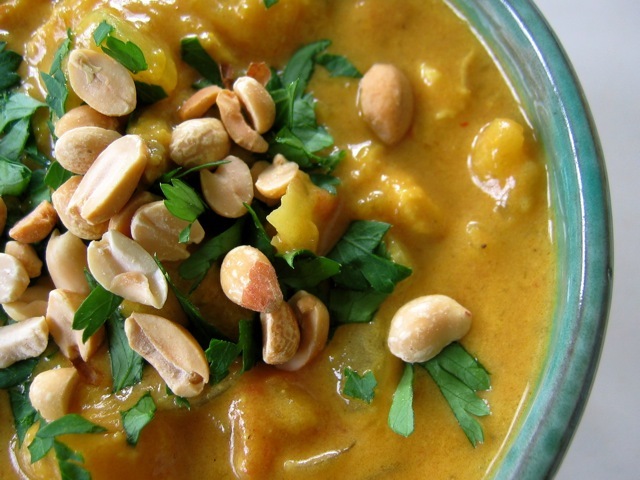 [%image reference-image float='clear right' width=350 caption="West African peanut soup is satisfying and cheap. "]Grow, raise, or hunt some of your own food. My uncle recently raised pigs on his farm. For $200, which included a one-time equipment fee, my dad bought one pig: an enormous amount of spare ribs, chops, sausage, shoulder, loin, scrapple, and bacon. Most of the meals I eat are vegetarian, but my husband loves meat, especially pork. So I’ve been making him sweet-and-sour pork and brined pork chops with meat from my dad’s pig. I feel better knowing where our meat comes from. And because so much meat comes from one pig, the actual shoulder and chops cost my wallet next to nothing (the local farm-raised equivalent in my area would’ve been $7 a pound for the shoulder and $4.50 for two bone-in chops). You probably won’t be able to grow, raise, or hunt all your own food, but if you have the time and space to try it, you’ll see some savings at the store and some serious satisfaction in your larder. Check out primers on growing food and raising chickens. And for more about hunting for food, read Steven Rinella's article on responsible meat-eating. #(clear n4). Experiment with one new spice every month. Simple meals magically become more exciting with the right spices. I use smoked paprika and cumin in black beans and rice; bright yellow curry powder mixed with coconut milk in coconut curry with vegetables; and, like every good Marylander, the traditional seafood seasoning Old Bay — a mixture of celery salt, mustard, red and black pepper, bay leaves, cloves, mace, cardamom, paprika, and other seasonings — in everything from stir-fry dinners to oven fries. Try inexpensive spices like cumin and coriander, or splurge on cardamom and saffron. A little goes a long way, and the spices will keep for a year. You can also get great prices at local spice warehouses and ethnic grocery stores. #(clear n5). Shop at ethnic grocery stores. My husband and I make regular trips to our local H Mart, a chain of Asian grocery stores located in 10 states throughout the U.S. On our first visit — after spending 30 minutes in the sauce aisle alone — we left with oyster sauce, black bean sauce, rice flour, garam masala, and two kinds of red bean paste, all at bargain prices. Ethnic grocery stores — try a Middle Eastern grocery for chickpea flour, or a Latin market for dried hibiscus flowers — offer great deals, foodstuffs you can't find elsewhere, and unusual cuts or varieties of foods you may already be familiar with, such as beef knuckle bones for making stock. Not sure where to start? Look for ingredients that seem familiar, then move on from there. #(clear n6). Buy fruits and vegetables in season. Fruits and vegetables lose nutrients from the moment they’re picked. Mass-produced fruits and vegetables suffer the most, losing nutrients due to mechanical harvesting and long transport-to-market times. Even when produce is shipped at the perfect freshness-retaining temperature, its health benefits lessen with each travel day. Fruits and vegetables taste better and cost less when they’re locally grown and at the peak of their seasonality. Sustainable Table can help you find out which vegetables and fruits are fresh in your state each month. #(clear n7). Put up seasonal excess for off-season eating. Because it's hard to eat local food during northern winters, food preservation is a great way to save some of summer's bounty for the cold months. Two summers ago, I canned fresh tomatoes so I could make pasta sauce with garlic, oregano, and olive oil throughout the winter. Last year, I froze string beans and corn cut from the cob. I even know a few people who extend rhubarb’s brief season by freezing it. Canning and freezing take some planning, but it’s a classic way to make good on buying (or growing) in bulk. #(clear n8). Cook a restaurant dish at home. Making restaurant and bakery dishes at home can be intimidating. I was scared to make pain au chocolat, the buttery French croissant filled with chocolate. The dough needs to be rolled to a specific size many times, then left to rise in between. But the chocolate croissants turned out beautifully — and, with simple ingredients like flour, yeast, sugar, and milk, didn’t cost much. Try cooking your favorite restaurant dishes at home by finding a recipe that doesn’t use expensive or complicated equipment. For example, when I make French fries at home, I toss them with olive oil and herbs like chopped rosemary and thyme, then bake them in the oven instead of using a hard-to-clean fryer. (Of course, you can always tackle real restaurant-style fries at home, too.) My husband likes oven fries made with Russet and Yukon gold potatoes, while I prefer the starchy potato flavor of red potato fries. Or test out a favorite takeout dish, such as pad thai or crispy orange beef. You may never go back to the takeout menu again. p(bio). Jennifer Walker is a Baltimore-based freelance writer who blogs about food at My Morning Chocolate.